Finishing up at Tikal, I get the biked fired up. It’s running rough again, and I pull out of Tikal’s parking area. 2 or 3 kilometers down the reserve road the engine sputters again. I gingerly work the throttle to find a sweet spot, but it dies. I start the bike up a few times, but can’t seem to keep it running. This isn’t the best spot to break down. There is nothing for 30 kilometers, and on both sides of me is dense jungle. I realize that each time I crank the engine my battery is getting weaker, and that eventually I won’t be able to turn it over. That’s when my heart skips a beat. Movement up ahead catches my eye. I look up as a jet black jaguar saunters out of the jungle less than 50’ from me and wanders across the road eyeing me. I swear I can see it licking its lips. My desperation to get the bike running goes up a notch or two. Camping here tonight may no longer be an option! With only a few cranks left in the battery the engine catches, sputters, and finally settles into a low idle. I gentle manage to get more and more throttle without it stalling. At 5000 rpm I slip the clutch and get the hell down the road, anxious to put a few kilometers between myself and the jaguar if the engine dies again. I spend the next 2 hours listening to every subtle change the engine makes, and before long I pull into Santa Elena, the mainland town that leads to the causeway and island of Flores. This is a modern city, with shopping malls, chain restaurants, and people driving nice cars. 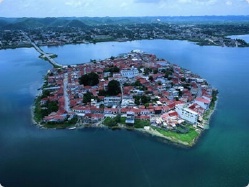 Other than Mexico City, I have not seen this anywhere else in Mexico or Belize. I later learn that a lot of European tourists frequent Flores, and this injection of foreign money has built this modern mecca. I ride across the causeway and stop at the first nice looking hotel I see. The room is decent, with a great view of the lake, and parking in the lobby for the bike. I like Flores already. Up early today to head to Guatemala, with quite a bit of apprehension. At least the first couple of hours will be familiar roads of Belize on the way past San Ignacio. The border is pretty typical from what I’ve seen, and leaving Belize is just as simple, friendly, and efficient as coming in. 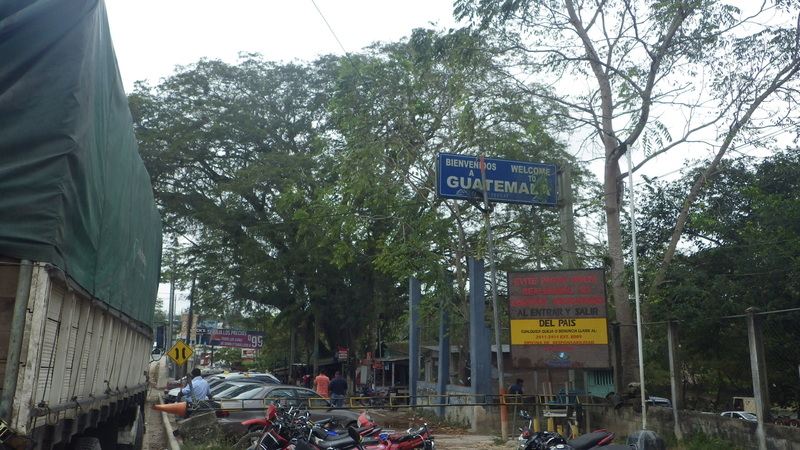 Going into Guatemala is equally easy, but very, very slow. A young kid has latched onto me to make sure I go to all the right buildings, in the right order. I don’t really need him as my Spanish is getting me by, and the signage is descent, but I’m sure he can use a little bit of coin for his efforts. Once I have all the correct paperwork in order I give him a few dollars and a toy water pistol. He heads off with a big smile, and I’m now in Guatemala. Getting away from the border town the first thing that strikes me is how lush and green everything is, and that despite a few potholes, the roads are once again beautiful winding mountain ribbons. 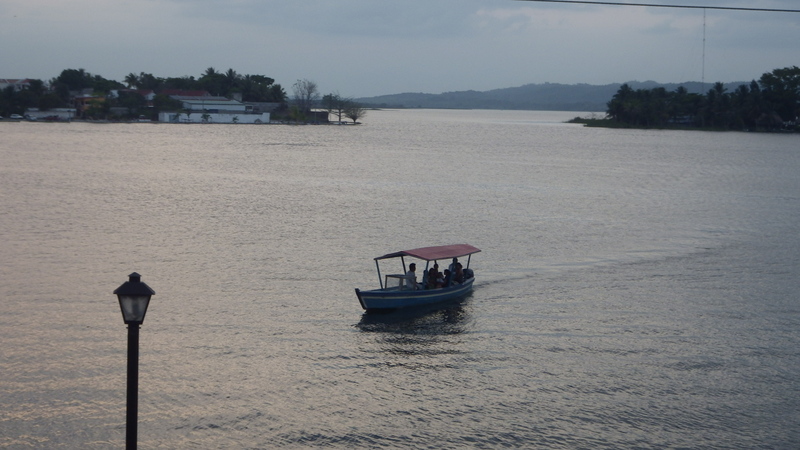 The sun is out, and I’m making good time towards Flores and Tikal. Several times throughout the ride I glimpse military platoons conducting exercises in the jungle, and I must say it is a little disconcerting to come around a bend in the road and see guys with machine guns held at eye level peaking out of the jungle at you! My first impressions of Guatemala is that everything is so lush and green, and wherever there isn’t jungle there are wonderfully thick crops planted on mass. 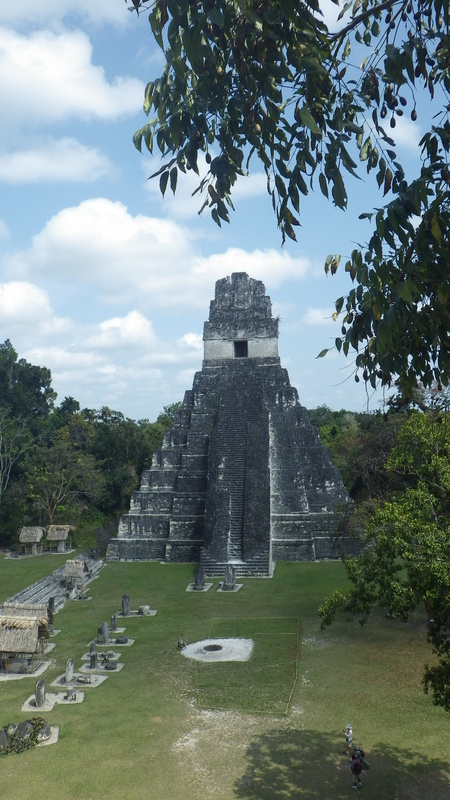 Before long I turn north on the road to Tikal, the most famous Mayan ruins in Guatemala. 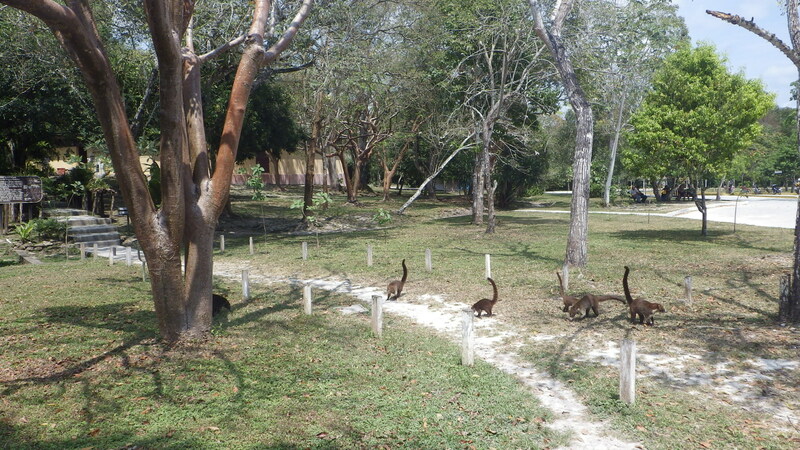 You access the archeological site via a 30 km long wonderful road through a jungle animal preserve. The road is signed at 40kmph, and every couple of kms there are strange animal crossing signs… Snakes, Turtles, Coati, Crocodiles, and even Jaguar. At 80 kmph I never saw anything cross the road. Once at the ruins I make my way around the massive site, all well preserved in the midst of a dense jungle. Many of the buildings are still engulfed by trees, and covered with soil and vegetation, yet to be uncovered. Along the way I run into the owner of a BMW 1200GS I saw in the lot. We`re both marching around in our riding pants and boots, dripping from the humidity and heat. He is from Durango, MX, and has been on the road for 7 months, on his way home from Tierra Del Fuego. Before long I realise I need to get back on the road to make it to Flores before dark. Back at the entrance, which is the only place where merchants can hock their wares (unlike Mexico where they are on you constantly while you`re trying to enjoy the ruins), I find a present for Rebecca. We haggle back and forth on price. I try to get him down a bit more, and to throw in a cold bottle of Coke. He won`t budge on the price, but will give me a Coke. I say if you won`t go cheaper, I want a Coke AND a Snickers! He counters with a Snickers, but no Coke. I have water on the bike, so we shake hands, both happy with our deal and banter. 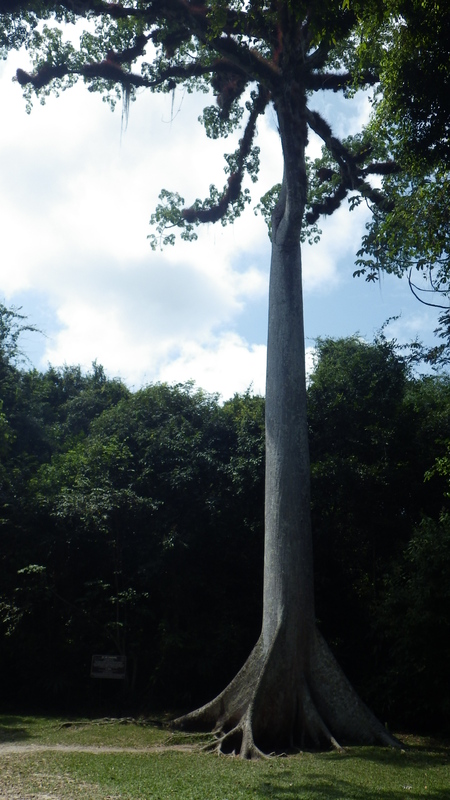 And with that I`m on my way out of Tikal, back onto the jungle reserve road…. sort of… there`s a problem with the bike. Today is Rebecca’s last day with me. Still not sure what’s happening with parts coming up from Guatemala, a bike that barely runs, and my leg looking pretty bad, I’m really worried about being on my own for the return trip to Canada. 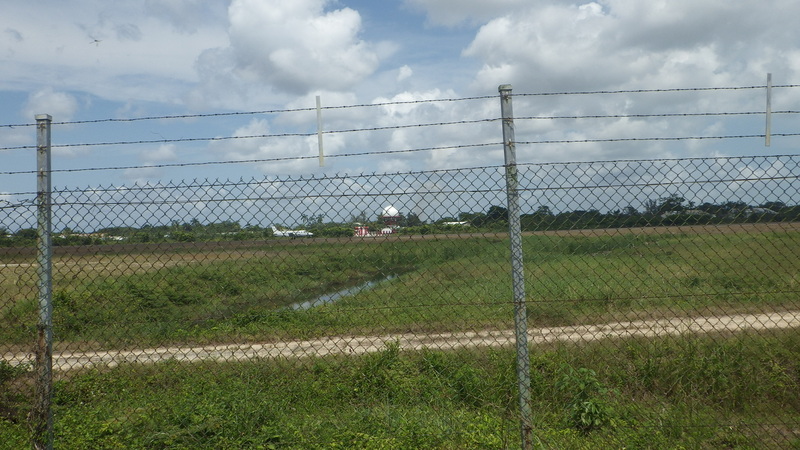 We pack up the bike and head out of bombed out hell hole that is Belize City. At the airport we get Rebecca’s flight in order, and I take off to find the Fedex depot to see if any packages have arrived. I’m not sure if they are coming under my name, Anthony’s, or his friend here in Belize City. At Fedex’s depot a friendly chap explains that nothing has come from Guatemala in the last 2 days, but that there is a shipment coming in tonight, and it will be cleared through customs by noonish tomorrow. I thank him, cross my fingers that my TPS (Throttle Position Switch) is on that plane, and head back to the other side of the airport to say goodbye to Rebecca. The airport has free Wifi, so I’m able to get some emails off. I don’t want to spend my last few moments with Rebecca fussing over the bike stuff and Wifi, but it’s so hard to focus. After she heads off through security I spend the next half hour making some skype calls to Anthony and Jose in Guatemala. Nobody is sure if the part ended up on plane yet or not. All I can do is find a place for the night, check emails, and come back to Fedex tomorrow. I park the bike along the fence next to the runway and wave to Rebecca’s plane as she speeds down the runway. Now it’s just me, a scary leg, and a broken bike. 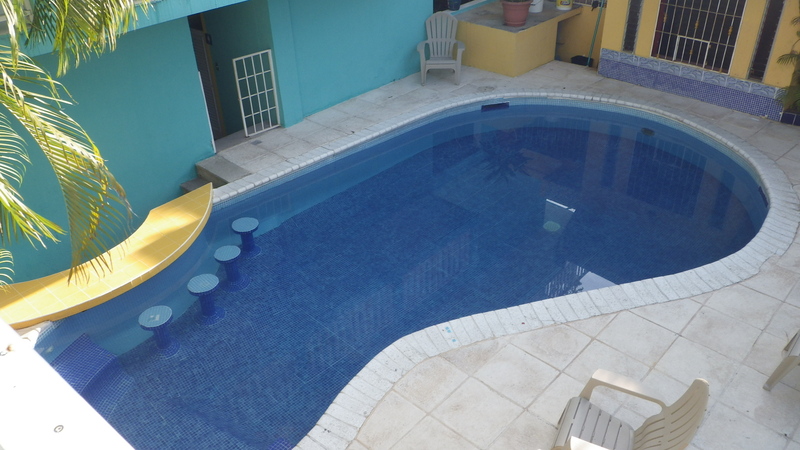 I know of an inexpensive place 30 minutes north of Belize City that has rooms and camping. Anything will be better than another night in town. Along the way another big CC motorcycle and I are having some fun taking turns passing cars. Eventually he signals to pull into a place, and as I whiz by I realize that he is turning into Slim’s Roadside Restaurant, where we had our first Belizean meal. I gear down, and turn around. I think I’ll have some lunch there as well, but as I pull up something feels VERY wrong with the bike. A flat front tire. You’ve got to be kidding me. My spirit is about shot. I’m not sure I can deal with this, given the last couple of days. To add insult to injury, it’s another failed valve stem. And, I don’t have a spare. The Garmin Tire Pressure Sensors are putting too much weight and vibration on the valve stems and wearing them through. Garmin will be getting an email. The only thing to do is dismount the front wheel and take it to a shop. Slim suggests that I take the local bus back into Belize City to Carribean Tire, which I know where it is. Full Riding gear, sweaty from mid-day working on the bike, and now a jammed full bus with no AC. Not good. While waiting for the bus I decide to try hitchhiking. The third vehicle to pass slows down, stops, and backs up towards me. As I step to the window I’m amazed. It’s Ray, a guy we had met 2 weeks ago AT Slims, who rides motorcycles and is a retired NYC cop. He offers to take me down the road to a mechanic. Less than 30 minutes later I have a repaired tire in hand, and a ride back to Slim’s from another friendly local. After remounting the wheel, I can finally grab some lunch. Slim has Gibnut (also called the Royal Rat). This may be my last day in Belize, and I have yet to try this local food. 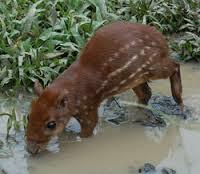 It is literally a large rodent that is stewed, and is quite tasty. The gentle Gibnut (Royal Rat) = tasty! My day ends with a 2 miles offroad stretch into a nature preserve where my accommodations await me, along with more Belizean hospitality and great food. So, with Rebecca gone, and a flat tire, the day started off Lemons. But, with a great meal, 2 Belizean friends (Ray & Slim), and a nice place to stay for the night, I’d say I found some Lemonade. Oh, and the Wifi here works. I found out the bad news. The part has not left yet. I can’t wait any longer. I need to head to Guatemala City myself to get the part. Now I need to limp the bike 9 hours, across another border, into an unknown and rumoured nasty/dangerous country. I really don’t want to break down there. At least in Belize I can communicate in English. In Guatemala, I may be SOL on the side of the road. Welcome to my BLOG. Let me show you around. If you'd like to know when I've posted a new story, click the FOLLOW link in the bottom right of your screen and follow the directions there. Where in the World is Wolfe? !